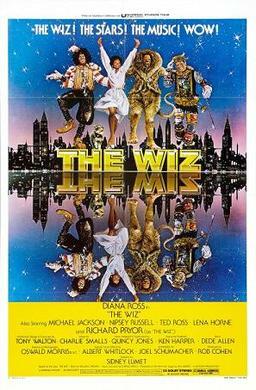 1978 - The Wiz, the musical film produced by Motown Productions and Universal Pictures, was released by Universal. The Wiz was a retelling of The Wonderful Wizard of Oz featuring an entirely African-American cast. The film follows the adventures of Dorothy[Diana Ross], a shy schoolteacher from Harlem, New York who finds herself magically transported to the wonderland of Oz, which resembles a fantasy version of New York City. Befriended by a Scarecrow[Michael Jackson], a Tin Man[Nipsey Russell], and a Cowardly Lion[Ted Ross], Dorothy travels through the world of Oz to seek an audience with the mysterious "Wiz", who they say has the power to take her home. 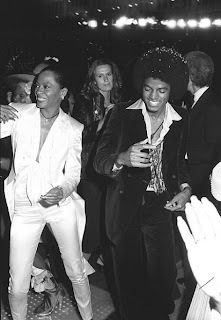 Diana Ross and Michael Jackson attend the premiere & opening night party of the movie The Wiz, at the Paramount, Los Angeles, October 24, 1978. At the Pitt’s Century Plaza Theater in Century City (Los Angeles) with the Jackson family & Diana Ross among others. The Wiz had its premiere in New York City, over a year after filming began. It was received with poor reviews and lukewarm box office returns, failing to recoup its expensive budget. Michael took the film’s failure personally, especially in light of the fact that his father and brothers had tried to discourage him from making it. Michael Jackson's performance as the Scarecrow was one of the only positively reviewed elements of the film, with critics noting that MJ possessed "genuine acting talent" and "provided the only genuinely memorable moments." Of the results of the film, Michael stated: "I don't think it could have been any better, I really don't." In 1980, Michael stated that his time working on The Wiz was "my greatest experience so far...I'll never forget that." Michael says: "It was incredible, wonderful. I learned so much from [Diana Ross]. We’re like brother and sister, really." 1987 - Bad hit #1 in US charts. The second single released off of the BAD album was the title track. It became the album's second #1 single. Bad stayed at the top of the Hot 100 for two weeks. Bad also went to #1 on the black singles chart. The extended version of the Bad video aired on MTV for weeks with the air times announced each day. Later, an edited version of the video was aired. At the end of October, the BAD tour moved into Motown-Detroit, Michigan. Michael was scheduled to perform at the Palace of Auburn Hills on October 24-26. The first of the three night stand in Detroit was a benefit concert for Detroit's Motown Museum. The two story house, Hitsville USA, where Berry Gordy originally started Motown, had been declared a historical landmark earlier in the spring. Since Motown relocated to Los Angeles, the building has been turned into a museum, organized by Berry Gordy's sister, Esther Edwards. When Berry Gordy was preparing to sell Motown Records to MCA and Boston Ventures, Michael was touring Europe. He wanted to do something for Berry and for Motown. Gordy suggested he do something for the Motown Museum. Michael did. He called Esther Edwards in Detroit from Hong Kong. The result was that Michael donated all of his proceeds from his first concert in Auburn Hills to the Motown Museum Historical Foundation. Michael has been a very strong supporter of the development of the museum since its inception. 1993 - Michael arrives in Mexico to perform 5 concerts at Azteca Stadium from 29th October to 11th November. 1996 - Michael performs HIStory concert at Singapore National Stadium in Singapore attending 65,000. In the States, Michael’s mini-movie Ghosts, which cost an estimated $7-9 million, premiered at the Motion Picture Academy Of Arts in Beverly Hills, California, alongside Stephen King’s full length horror movie Thinner. This entry was posted on 24 October 2010 at Sunday, October 24, 2010 and is filed under 1978, 1987, 1988, 1993, 1996 . You can follow any responses to this entry through the comments feed .